Perennial Wheat to Save Our Soil, But What About Compost? We — that is, almost all of humanity — get all our sustenance from the thin skin that covers out planet, the soil. In appreciation of this, the United Nations has declared 2015 “The Year of Soil.” “Soil is more important than oil,” stated Wes Jackson, founder of the Land Institute, in his keynote at this year’s recent NOFA-NY conference. Like oil, soil is a nonrenewable, or only slowly renewable, resource. Centuries go by before rainfall, freezing, thawing, and microbes and plants eat away at rocks to make new soil; on average, it takes a thousand years for the creation of a mere half-inch of new soil. The problem is that, as with oil, we humans are using up soil faster than new soil is being created — 10 to 40 times faster! Also, as with oil, that soil, as it is used, releases carbon dioxide and other greenhouse gases. Tillage exposes carbon stored in the ground to air, burning” it up, and annual crops, which are represented by sweeping fields of corn, soybeans, wheat, and other staples of civilization, put little of the carbon that they take in from air below ground. Agriculture is the second highest generator of greenhouse gases. Whew, what to do? 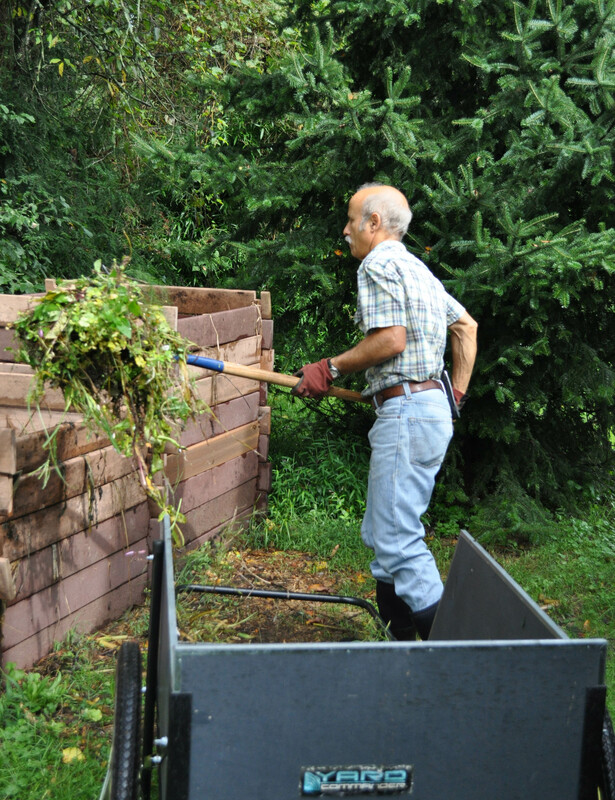 Dr. Jackson’s tack, for the past half century, has been to focus on shifting our staples from annual to perennial crops. Wheat, for instance. Kanza, a hybrid, perennial wheat under development at the Land Institute, would sequester carbon by not requiring annual tillage and by packing carbon compounds into its long-lived root system. Perennial crops also decrease opportunities for soil erosion (another source of soil loss), grow with less added fertilizer and water, and have the potential to increase biodiversity for a healthier ecosystem. What about vegetables, how are they treating our resources? Up to the podium stepped Tim Crews, director of research at the Land Institute, to give the roomful of organic and aspiring organic vegetable farmers and gardeners bad news: Our soil care is not sustainable. All that manure hauled onto our fields or piled high into compost piles is bedded with hay or comes from animals that have been fed grain. The grain or hay was grown in fields that were fertilized, most of it with commercial fertilizer which is mostly made from atmospheric nitrogen via the Haber-Bosch process which requires — you guessed it — fossil fuel for energy. Still, the fact that organic farming and gardening wastes less energy than conventional farming and gardening should assuage some of the guilt that resonated through the room. The soil of a good organic farmer or gardener will, in general, be higher in organic matter (5.4% vs. 3.5%) and, hence, carbon. Said plot will require less water, less pesticide, and less manufactured nitrogen for fertilizer. Compost, and compost alone, is how I maintain fertility in my vegetable beds. 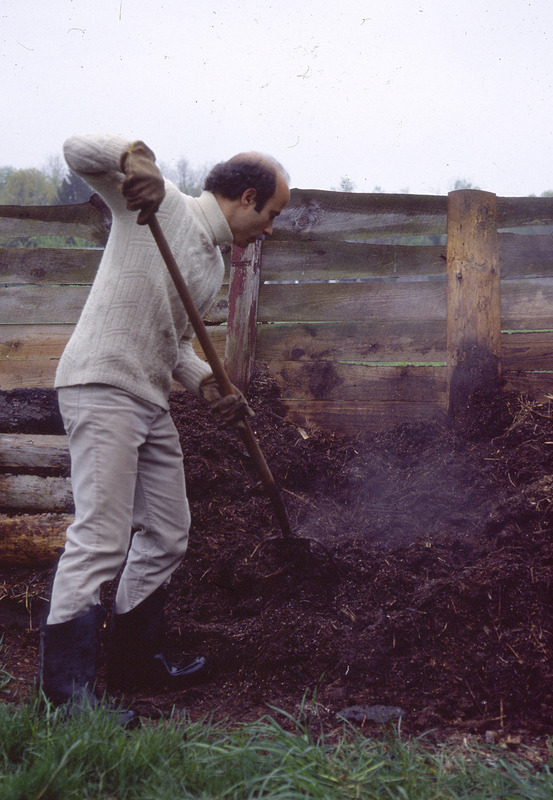 I do haul in some horse manure for that compost, and, as Dr. Crews pointed out, somewhere way back in that manure’s history, fossil fuel needed to be burned. But civilization, and especially industrialized civilizations, generate many waste products, of which horse manure is one. Picture also all the food waste from restaurants and supermarkets, autumn leaves and grass clippings that are considered “garbage,” even sewage effluent. All these organic materials contain carbon, some of which could be sequestered in the ground, to the benefit of agriculture and the environment, and some of which feed soil organisms and, in turn, plants. Better to recycle as much of those organic materials as possible into agriculture than let them go to waste or cause pollution. The bottlenecks here are cultural and political rather than agricultural. Another way, as I suggested at the conference, to make vegetable farming more sustainable would be to grow your own carbon and fertilizer. A perennial grain or hay field could be harvested for the grain or hay for the animals or, even more efficiently, just for hay to use either as mulch or for composting. Running hay or grain through animals burns up carbon to grow and fuel the animal to the tune of, on average, about 6 times more needed in terms of calories. That is, for every 6 calories we grow and feed to a cow, we get only one calorie back when we eat the cow. Left to its own devices, any field will naturally build fertility. Bacteria, free-living bacteria and symbiotic with the roots of legumes, harvest atmospheric nitrogen and put it in the ground, and the combined action of myriad soil organisms slowly chew away at a soil’s rocky matrix to release other nutrients for plant use. Plants grow, their roots oozing substances that further stimulate microbial activity and soil fertility. 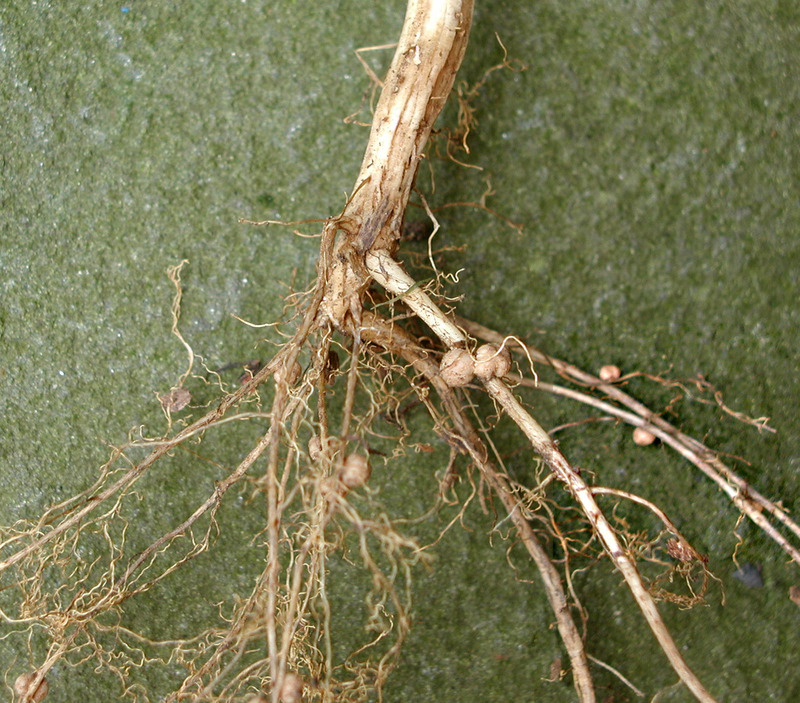 Nodules from nitrogen-fixing bacteria on soybean roots. The key word in the previous paragraph is “slowly.” In order to be able to harvest fertilizer in the form of hay from a field year after year, sufficient time must be allowed between harvests for fertility to be garnered from the air and rocks. For that you need either more land or less harvest. The big picture, then, is to have more land, to make better choices in how the land is used, to utilize organic practices, and have fewer people. With the problems of soil improvement, global warming, sustainability, and agricultural production solved, I’m going to sow onion seeds. Planted in flats in potting soil at 7 seeds per inch, I should have plenty of pencil-thick seedlings ready to poke into holes in compost enriched beds in early May. This entry was posted in Gardening, Planning, Soil, Uncategorized, Vegetables. Bookmark the permalink. Trackbacks are closed, but you can post a comment. I hope you’ll let us know when you find perennial wheat available for sale! There’s a pretty clear photo of them at . Does that do the trick? Put “compost bin” in the search box for my blog. Wow, it’s almost like somebody is listening to the sub-culture of Permaculture! Anybody who knows about Joel Salatin or Mark Shepherd already knows this to be true… glad to see the sub-culture is beginning to crack through into mainstream!